It is part of our commitment to go beyond the minimum legal standards to ensure high standards in food quality and food safety. North Bay Trading Co. participates in voluntary food safety inspections, with participation in the SQF Food Safety certification administered by AIB International certification body. Our GFSI Audit Certificate shows we keep current. AIB International was founded in the US in 1919. The goal of the organization has been to put science to work for those in the food industry. The organization focuses on providing third party inspection services, food safety education, research, and technical services. What does Food Safety do for You? What Is a Food Safety Inspection? This area of the food safety inspection includes the entire operation from accepting food into the facility to sending the food out to consumers. The inspection examines the processes and how the personnel at the company perform the processes. One example of this review is checking procedures for cleaning, inspection, and pest monitoring in the storage areas. Another part of the review is examining vendor approval procedures. The Maintenance For Food Safety area examines equipment and food contact surfaces. Procedures are examined as well as records for repair and prevention. An example of this area includes checking machinery to make sure lubricants are food-grade and drip pans capture lubricant leaks. The entire process of the cleaning is examined by AIB. Equipment is checked, maintenance records are examined, and methods for how staff cleans is reviewed. Cleaning compounds and sanitizers are checked. Schedules for deep cleaning are examined to make sure the cleaning process is thorough and fulfilled. Every business in the food industry that is part of a GFSI food safety program needs to have an Integrated Pest Management Program. Pests are taken seriously in the food industry and this area of the inspection is quite extensive to ensure the highest quality and safety of the food. A site map is examined to check the locations of all pest-monitoring devices. Insect traps are reviewed as well as the history of insect capture. This final segment of the inspection examines the company and how it views food safety. Every program documented (or not documented) by the company is examined. This segment is about the company being accountable for food safety including the ongoing training of the staff. 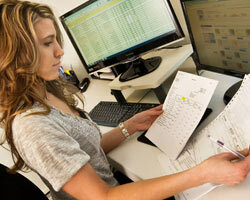 Training records for all personnel are examined for accuracy and effectiveness. Self-inspection records are examined. Customer complaints are reviewed as well as company reaction to those complaints. It is our commitment at North Bay Trading Co. to provide high quality food products and uphold high food safety standards.